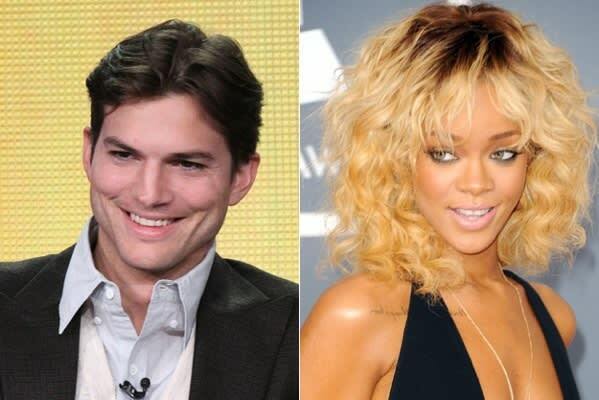 In March 2012, Rihanna was reportedly partying with friends at Colony nightclub in L.A. when she got a text message from Ashton Kutcher around midnight. The singer promptly exited the club and paid a visit to the Kutcher's house, where she stayed until 4 in the morning. Immediately following the late night rendezvous there was plenty of speculation about the nature of their relationship. Rihanna shot down rumors that the two were secretly dating and even ethered a British reporter for asking about it. Smash Probability: Their reputations precede them. That's all we can say.